Humanoid Robots: Modeling and Control provides systematic presentation of the models used in the analysis, design and control of humanoid robots. The book starts with a historical overview of the field, a summary of the current state of the art achievements and an outline of the related fields of research. It moves on to explain the theoretical foundations in terms of kinematic, kineto-static and dynamic relations. Further on, a detailed overview of biped balance control approaches is presented. Models and control algorithms for cooperative object manipulation with a multi-finger hand, a dual-arm and a multi-robot system are also discussed. One of the chapters is devoted to selected topics from the area of motion generation and control and their applications. The final chapter focuses on simulation environments, specifically on the step-by-step design of a simulator using the Matlab® environment and tools. This book will benefit readers with an advanced level of understanding of robotics, mechanics and control such as graduate students, academic and industrial researchers and professional engineers. Researchers in the related fields of multi-legged robots, biomechanics, physical therapy and physics-based computer animation of articulated figures can also benefit from the models and computational algorithms presented in the book. Dr. Dragomir N. Nenchev is a Professor at Tokyo City University, Japan. He is a leading robotics expert with 35 years of experience in robotics, focusing on modeling and motion control of redundant robots, parallel-link robots, free-floating space robots, flexible-base robots, humanoid robots, and home robots. Dr. Atsushi Konno is a Professor at Hokkaido University, Japan. He is a leading robotics expert with 26 years of experience in design, modeling, and control of humanoid robots. His team presented the famous drum beating and martial arts performing humanoid robot at the 2005 Aichi Japan Expo. He has published more than 60 journal papers and 100 reviewed international conference papers. Dr. Teppei Tsujita is an Associate Professor at National Defense Academy, Japan. He has been active in robotics research for 9 years, with research interests in humanoid robots, design of haptic devices, magnetorheological fluid, surgery simulators, and their applications. He has published numerous articles in archival journals and given lectures at worldwide conferences such as Advanced Robotics, IEEE International Conference on Intelligent Robots and Systems, and International Journal of Humanoid Robotics. 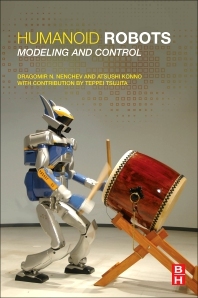 The content of this book is very useful to robotics researcher. I strongly recommended to use it as a text book.